Wholesale rates are quoted strictly via phone to established businesses. A limited amount of dealers per area will be accepted. Sales can be brisk by word of mouth. Hands on sales by demonstration will increase sales tremendously. Like I have mentioned before, Max really is my #1 salesman. 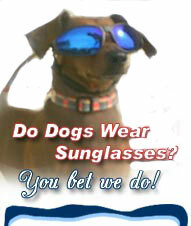 Each pair of sunglasses come pre-packaged with case and complete training instructions. 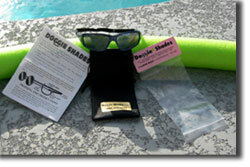 The re-closable poly bag package allows for "Try and See" sales. Each bag is color-coded and labeled with size/weight recommendations. The label also has a punch hole for easy display purposes. A minimum first time order is 2 dozen. First time orders must be pre-paid by a cashiers check or credit card. Any returned items are subject to a 10% restocking fee. After your account is established, the minimum order is 1 dozen. Quantity purchases are subject to a price break.